Dinosaur Jungle is the second zone of Sonic and the Secret Rings. 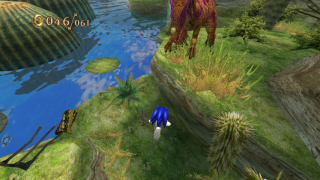 Sonic runs through a jungle inhabited by dinosaurs. He will have to surf down rivers using logs, run on dinos to reach higher ground, and even run from a stampede! This is one the rare cases of Dinosaurs in the Sonic series. The music that plays in this zone is The Wicked Wild. The flying dinosaur, holding King Shahryar's weight, decided to let the king go. Falling down, he was rescued by a steady rock, hanging over a medium cliff. The king was mad, of course, but gave Shahra and Sonic information about the dinosaur's new location, pointing at a far-away factory in the seas of the jungle. This page was last edited on 18 April 2018, at 18:14.